You guys, I have some crazy news for you: I won a giveaway! Hella Holo Customs does a healthy number of them throughout the year, and I pretty much enter as many as I can, but this time, I actually, really, truly won! 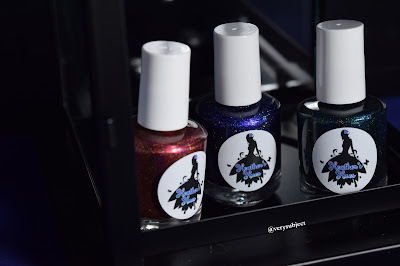 This particular giveaway was for a trio of polished from Heather's Hues, a brand that I currently only own one other polish from. 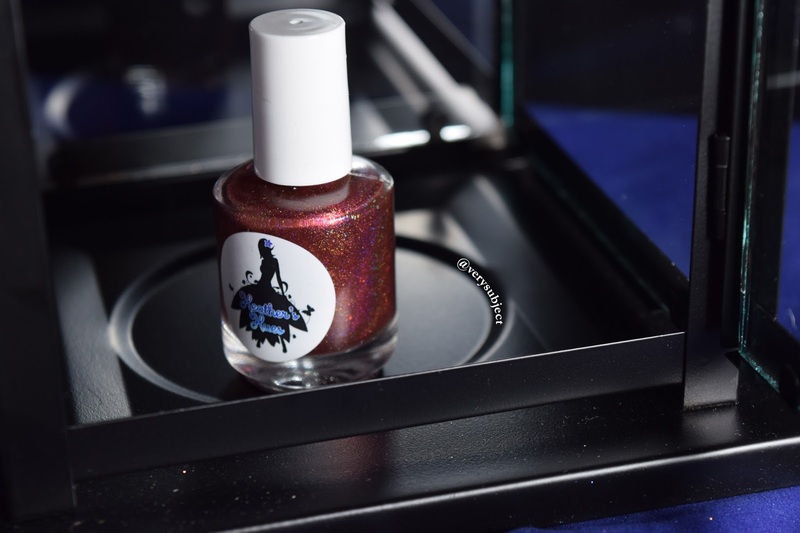 They make some gorgeous creations, and I honestly would own more if I could, but unfortunately I don't quite have the funds to literally just buy every single polish that catches my eye. The formula on these is really well done! They are slightly on the sheer side, as they have jelly bases, but that's a small sacrifice to ensure how perfectly the flakies, holo, and shimmer shine through. Unlike some jellies, I didn't feel like I had to work super quickly or risk having patchy streaks on my nails. The final results after drying were actually just as shiny and squishy with and without top coat, which is ridiculously impressive! 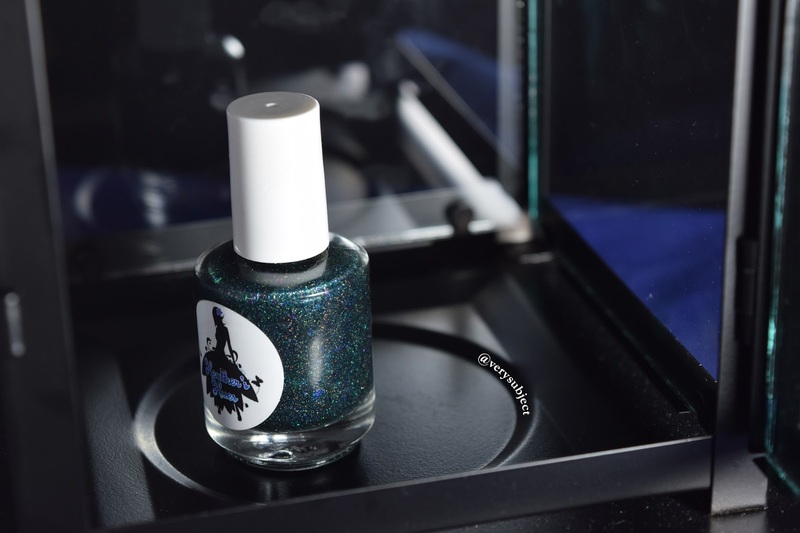 Mistress is a deep blue (more or less) scattered holo with a gorgeous purple shimmer. I needed 3 coats for opacity. This is my second favorite of the trio, and it's super glam. I keep thinking it's actually named "Enchantress", because I can just picture a Glamorous Enchantress (à la Dark Lord of Derkholm) wearing a slinky, sparkly, very low-cut dress made of a slightly transparent fabric in this color to lure unsuspecting adventurers into staying at her lair until they waste away. Basically, I love it and I'm definitely about to go reread that book now. 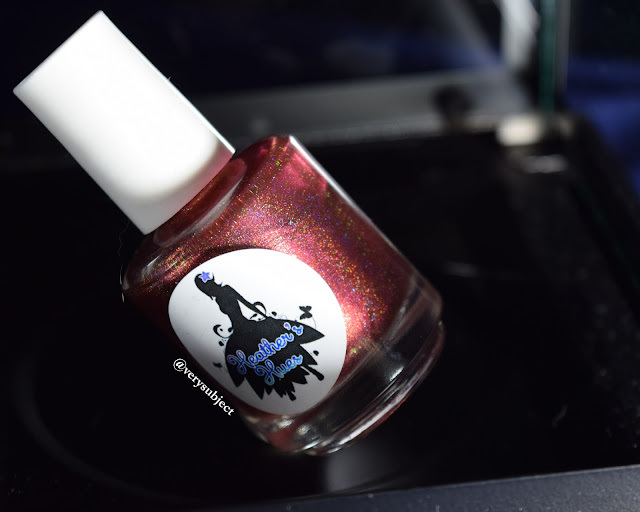 Seductress is a red with an orangeish-reddish shimmer, a more linear holo than the other two polishes, and a smattering of matching shifty flakies. Huntress was my surprise favorite! 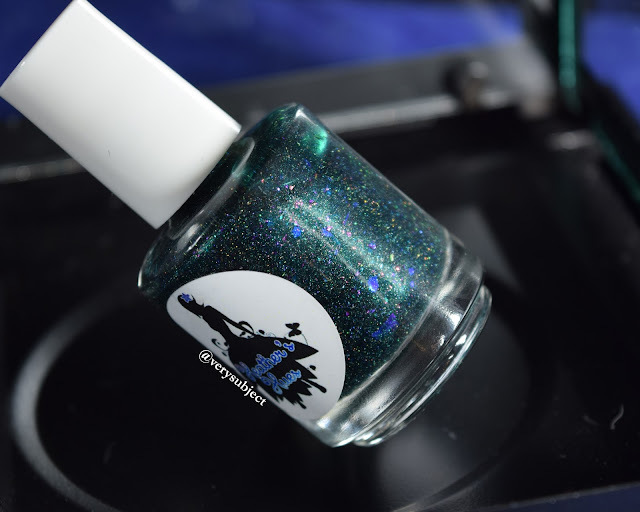 It's a deep emerald filled with multicolored metallic flakies as well as the requisite holo for it to be an HHC. I love the jewel tones in this one; they would fit in perfectly in a lush, wild, enchanted forest. That's all! I love these colors for Halloween, and even for autumn at large! If you're in love with them too, hopefully they'll be available for purchase in the future. Before I run off, I'm a little split about what I'd like to do for my next post. I had some Don Deevas come in, so I could swatch those, but I'd also kind of like to do another makeup post. My shadow collection has grown a lot since that post where I swatched every blue eyeshadow, so I'm pretty sure I won't be doing THAT again, but I have loads that I haven't shared before and would love to pull out to ogle. Alternatively, I could try to do my first perfume review (which would probably end up showing the world how dumb I am at perfume, lol, but would also force me to actually test some more of my largely-unused collection). What would you like to see? Leave a comment! Your swatches are beautiful as ever, love "Huntress" that green polish is amazing and gorgeous.